This is an example of Bennie's renowned saw and file borderwork surrounding this fine stone of natural, untreated Royston turquoise from Nevada. The stone is set in a handmade serrated bezel. A free-swinging feather is suspended below the stone and a matching pair of Sterling feather earrings on hooks accompany this set. The pendant is strung on an eighteen-inch Sterling chain which rounds out this set. 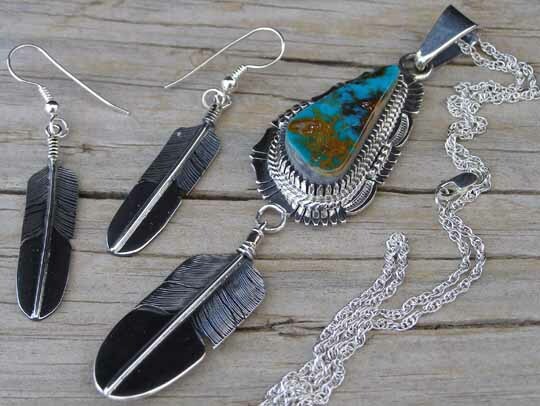 Stone: 1 1/8" x 1/2"
Pendant (excluding feather, bale & jump rings): 1 9/16" x 7/8"
Pendant feather: 1 5/8" x 9/16"
Total hang of pendant (top of bale to tip of feather): 4"
Earring feathers: 1 1/2" x 5/16"
Total hang of earrings: 2 1/8"